My son Ryan and I went out for trophy trout on Saturday morning. I had pitched an article to Tide magazine, and the editor took me up on it immediately. In fact, he wanted it much sooner than I'd planned to do it. So...I decided to go for the long shot--catching a trophy trout on demand. 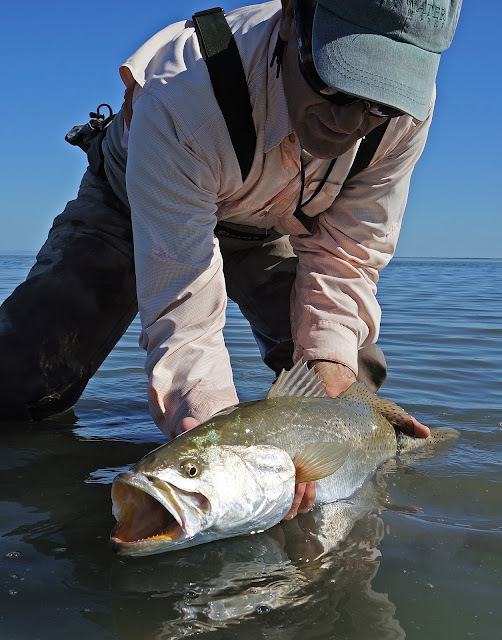 We headed to South Cullens Bay, where there are often lots of big trout during the winter. I was pleased to see that the tides were about as low as they get, forcing us to go around the spoil islands and enter Cullens opposite Stover's Point. The water was off color in the deeper water, but as we approached the shoreline, it gradually cleared up. We began seeing wakes, but could not identify the fish in the early morning light. We'd arrived far too early to sight cast using the sun, but the wind was almost calm, so we were able to see breaks and wakes all around us. We decided to wade toward the shoreline, hoping that the shallower and clearer water would hold trout that were avoiding the boat traffic. Almost immediately, we began spotting game fish breaking and driving dramatic wakes ahead of us. Hoping that they weren't sheepshead, I decided not to blind cast, but to remained cocked and ready for any surface disturbance within casting distance. About that time, two boats headed toward us from the south, giving the shoreline a "haircut." Annoyed, I watched and listened to them yelling back and forth between themselves. Suddenly, they all started yelling. "Trout, they're all trout!" I heard one guy scream. As they approached, I waved my arms, hoping they'd run to deeper water before they gave all the fish a severe case of PTSD. As they turned away from the shoreline, I could see a dozen big wakes slowly heading toward us. Big trout tend to spook straightaway, rather than zig zagging, and these wakes were slow and straight and had a stately, even slow-motion quality. They were trout, all right. They all settled down and disappeared, but I knew they were all around us, so I watched for the inimitable signs of fish snaking across the surface. Reds do it, too, in South Cullens, since the turtle grass forces the fish into the upper water column. But trout behave slightly differently when snaking on top. Within a few minutes, I spotted a few fish snaking toward me, wagging their tails. Casting just ahead of them, a wake sped forward and took the Mother's Day Fly, The trout's head came out of the water, thrashing; and the fly popped out. I knew that it had been a pretty big fish, and even though I'd lost it, the experience told me two things: most of the fish were trout, and they were willing to eat. Ryan and I took a break on the boat a bit later, then headed westward into an area where the surface was glassy. We'd be able to spot fish a long way off, as long as the wind stayed low. We began to see incoming pairs and small groups, and I got a nip from one of them. But big trout are exceedingly demanding when it comes to presentation. As long as they are heading toward you, you have a chance, but once they turn, it's very hard to get them to eat, because the fly is usually crossing their path. Wondering if all of our luck had played out, I suddenly spotted a group of fish--probably a dozen or more--heading toward me in the glass. I yelled, "They're probably reds," but I hoped otherwise. As they approached my casting distance, I laid the Mother's Day Fly out ahead of them, and began stripping slowly. The wakes overtook the fly, but frustratingly did not take it. I felt some resistance and pulled only to find that the fly was fouled with grass! A big trout that had been dogging it suddenly went head down, perhaps to take a look at the unnatural acting fly, and a black tail the size of my hand waved at me. I knew they were all trout at that point. I stripped the fly in, tore the grass off, and looked up only to see that the group had broken up. A couple of singles had spooked and were breaking off, while the remnants of the pod were swimming slowly away. Desparate, I quickly stripped more line off and casted ahead of where I thought they were. It was a low percentage play, but there was a swirl, and one was on! It jumped out of the water on hookup and shot away. I could see that it was 26-27 inches and knew that there was a good chance I'd lose it. But a few minutes later I landed her, got some photos for the article and released her. We fished a while longer, but didn't catch any more trout. Perhaps it's needless for me to say it, but...we're going back soon!